How did the technological progress that accompanied the Industrial Revolution affect the quality and length of human life? What results can we expect from attempting to “restrict” technology? What are the political implications of the ecology movement? What valid issues are raised by instances of industrial pollution? What are the underlying motives of the environmental crusaders? Although aspects of the environmentalist movement have changed since the early 1970s, its ideological essence — its fundamental philosophical perspective on man’s relationship to nature — has not changed, leaving Rand’s analysis and critique as pertinent today as it was then. Note: After this lecture was recorded in 1970, Rand expanded on her initial speech in an essay by the same name. This valuable addition appears near the end of the lecture in a new recording by a voiceover artist. Ayn Rand created and defined her philosophy, Objectivism, in the pages of her best-selling novels, particularly The Fountainhead and Atlas Shrugged, and in a series of nonfiction books that address a wide range of fundamental issues in philosophy. Born Alisa Rosenbaum in Tsarist St. Petersburg in 1905, Rand witnessed the Russian Revolution as a teenager and promptly condemned communism as immoral for sacrificing the individual to the collective. In 1926, shortly after graduating from the University of Leningrad, she fled to America, adopting the pen name Ayn Rand to shield her family from possible persecution once her anti-communism became well known. In Hollywood, she wrote scenarios for famous director Cecil B. DeMille and met her future husband on a movie set, but the couple struggled financially for years. Then came a string of writing successes: a Broadway play, followed by her first novel, We the Living (1936), then a novella called Anthem (1938), and later her first best seller, the story of a fiercely independent architect named Howard Roark in The Fountainhead (1943). All these works of fiction feature gripping stories and exalted, egoistic, this-worldly heroes. 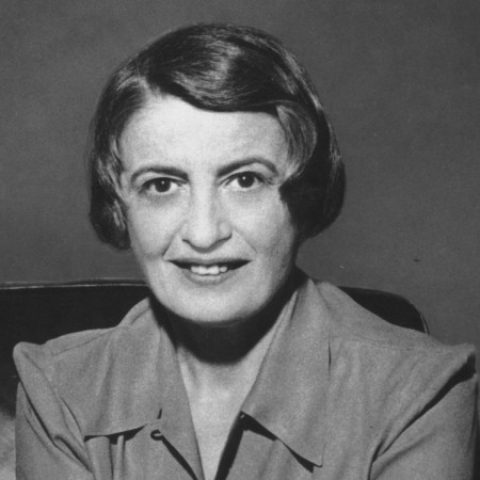 In writing Atlas Shrugged (1957) — the story of a man who said he would stop the motor of the world, and did — Rand had to define fully her new philosophy of reason, rational self-interest, and laissez-faire capitalism. Thereafter, and until her death in 1982, Rand amplified and explicated her “philosophy for living on earth” in a stream of books whose theoretical essays and cultural commentaries cover important topics across the five major branches of philosophy: metaphysics, epistemology, ethics, politics and esthetics.